Clarence E. Locke (1866-1945) from Kensett, Iowa, USA, was a holder of 2 US and 2 German patents for a calculating device—slide bar adder, which became popular as Locke Adder. The first patent is №689680 from December, 1901, the second is №779088 from January, 1905 (see the lower patent drawing). Locke was a holder also of another patent for a hand stamp (US pat. №686815). The Locke Adder (see the lower photo) is a row adder, made by metal (stamped tin), paper and cloth, with measurements: 2 cm x 29.5 cm x 12.3 cm. It used alternating fixed and moveable horizontal bars, as carrying from one column to another is manual. The nine moveable slides show either red or green while in the zero position, and expose either silver or yellow as the slides are moved to the right. Between the slides are eight fixed bars, painted black with white numbers from 1 to 9. The sliding bars of hollow aluminum are manipulated with the fingers in order to determine sums. 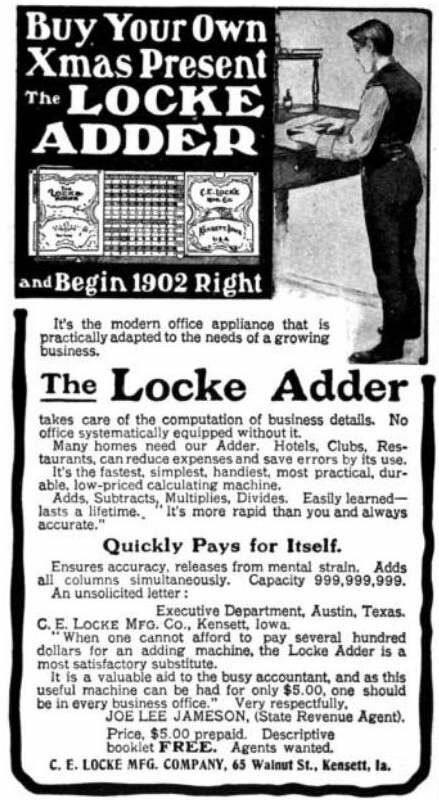 The Locke Adder was a very beautiful, but not a user-friendly calculator. It enjoyed a modest (albeit brief) success, thanks to a low price and an extensive print advertising campaign in the first few years of the 20th century (see the lower image). It was on the market for less than ten years, probably being supplanted by dial adders such as the Calcumeter and the Calculator. The machine was manufactured by the inventor himself in his company—C. E. Locke Manufacturing Co., 98 Walnut str., Kensett, Iowa. The prices were: 1901-05: price $5; 1906/; price $5 (oxidized copper finish) and $10 (oxidized silver finish with case); 1908: price $5 & $10. 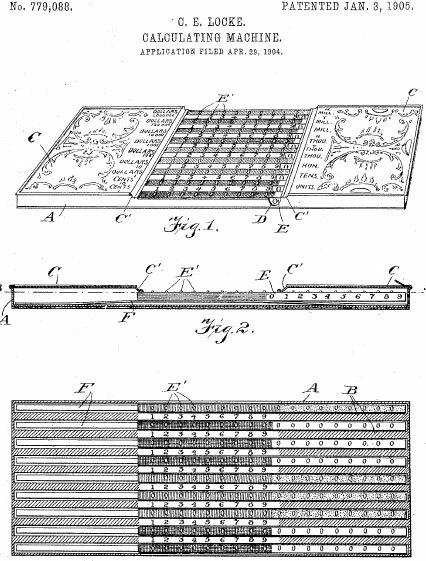 What is known about the inventor—Clarence Locke? Clarence Elmer Locke was born in 1866 in Edgerton, Wisconsin, as the first child in the family of Charles Locke (1837-1903), a Civil War veteran and lumberyard owner and merchant from New York, and Mary Elmer Holden-Locke, (1842-1908). The family had one more son, Willbur (born 1879) and a daughter, Jessie M. (b. 1874). Clarence Locke graduated from Cornell College in Mt. Vernon, Iowa in 1892, as Bachelor of Civil Engineering and in the next year he married to Frannie Locke (b. 1867). In 1905 was born their daughter Dorothy. Then Clarence worked for a time as a civil engineer in Minnesota, and finally joined his father's lumberyard business in Kensett, Iowa, where he worked as a dealer of lumber and coal. In 1910s Clarence Locke moved with his family to New Mexico, where he bought a farm. Clarence Elmer Locke died on 15 July, 1945, in Dona Ana, New Mexico.